November 19, 2012 mikacovington1 Comment on Rep. Dumbass Steve Anti-Queer King!! So as many of you may know I believe that Israel should stop bombing Gaza and I think that Hamas should stop bombing Israel. Well, I also think that the United States should stop funding Israel’s Military. In addition, I believe the United States should stop all foreign aid to Israel until they stop all hostilities towards the Palestine people. Since Rep. Steve King is my Congressional Rep. I sent him a letter explaining to him how I feel about this issue. 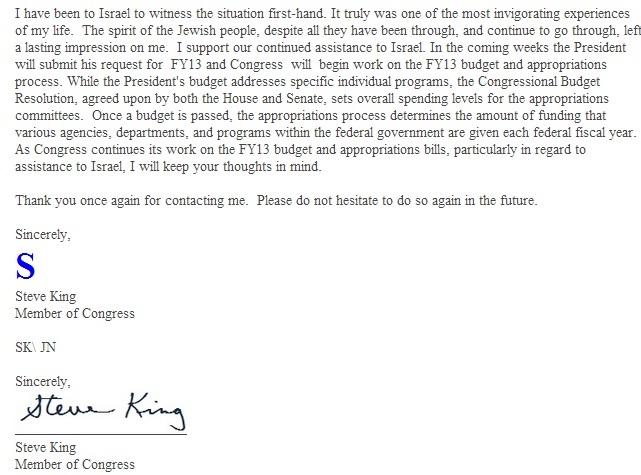 Rep. Steve King sent me this message back, “Thank you for contacting me with your support for foreign aid to Israel in Fiscal Year 2013 (FY13). It is good to hear from you.” Ok, so first of all I contacted him talking about my opposition to foreign aid to Israel in Fiscal Year 2013. 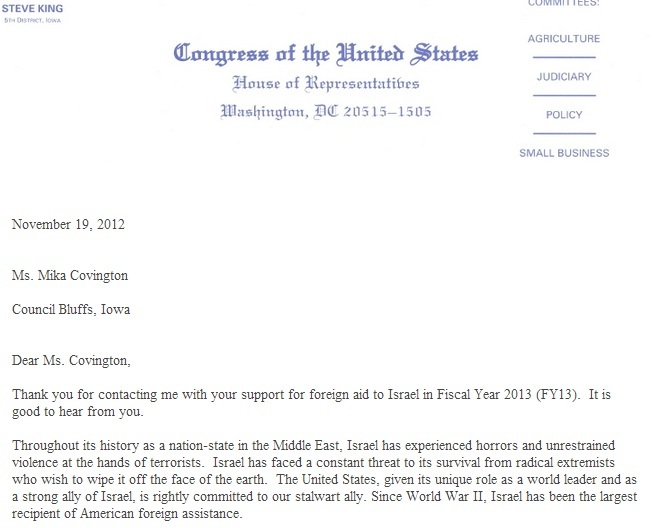 I am pissed at him because I did not say I support the foreign aid to Israel I said I was against it. In addition, the response just pisses me off so much because the staffer who wrote the letter did not even pay any attention to anything I said in there. I am really sick of these Republicans thinking that we have to support Israel because of what happen to the Jews during WII. I know it was very horrible but that does not give the United States the right to fund Israels wars against other people that Israel doesn’t like just because of their religion. This entire war between Israel and the Palestine is all about race and religion. If the United States wants to claim that they are not taking sides in this we must look at who funds Israel’s Iron Dome project. That would be the United States! So only think I am demanding here is that the United States stop funding Israel military projects and end all foreign aid to Israel until they stop trying to wipe Palestine off the face of the planet. Previous Obama and Gronstal Won!! Equality Won!! Victory!! Next Mika is Not Dignified! !